Money-saving tip: Present your AAA or CAA card to save $1.00 off the ticket of each person in your group. So, we went to Birch Aquarium. And had fun. And even learned stuff. The first thing we did was eat our picnic lunch. Let's just say that we're a slow-moving group, and we so did not get there when they opened the doors at 9 a.m. Not even close. Also, my THREE wrong turns, even with my navigator (I'm a poor listener), didn't help matters. This is a sarcastic fringehead. It's my favorite fish. Although only 9 inches long, it's feisty and loaded with attitude, even charging scuba divers. It has bushy eyebrows. You can find it hanging around off the California coast about 10 to 200 feet down. 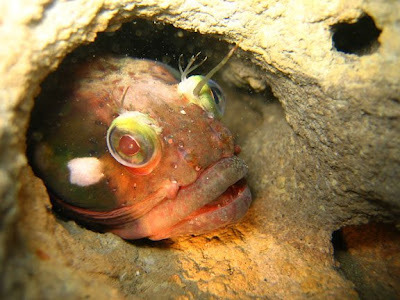 The sarcastic fringehead lives in holes and old bottles, especially beer bottles. Females usually mate with the largest male and then leave the eggs in the male's shelter where he'll guard them. HOWEVER, females do not like to mate with males who live in old and dirty shelters. Him: Hi there, baby. I can eat my weight in fish. I'm easily the buffest fringehead on the reef. Her: Do you pick up after yourself? How often do you clean? When was the last time you dusted? Let me check out the inside of your bottle. And, last but certainly not least, I leave you with a shot of me and my little sister in a shark's mouth. Yes, we are naturally that cool! It's a family curse. Tomorrow: the beach! I'm the proud owner of a brand new boogie board. Oh, you didn't know I was an expert boogie boarder? Okay. Fine. I'm not. But I do catch the odd wave. Especially when Child #2 stands next to me in the ocean and shouts, "Jump, Mom!" just as a promising wave approaches. Oh....I shed a lot when I was pregant too!! But I'm still doing it!! I think I lost a fresh crop of about 100 hairs in the shower this morning! Yet another wonderful reminder of my vacation last year. Loved the Birch Aquarium and it's seafront location. When we went last year, the U. S. Open golf tourney was still going on (remember, this is the one where Tiger and The Other Guy played a playoff round on Monday) and we had to get past Torrey Pines to get to the aquarium (IIRC). We ate lunch at a nice little sandwich shop (name escapes me) but I loved the area around the aquarium. This is a cool travelogue. Keep'em coming. Ok, we want to see boogie board pics. I love a good aquarium. We've got a good one here. This makes me want to go to dinner parties because now I have conversation starters. looks like you all had a great time! Aquariums are awesome! I have a picture of my younger son in that very shark mouth. The aquarium was one of the places we did hit on our last trip to S.D. Lovely shot of the fringehead....I feel like I might be calling my older son that tomorrow with his longish bangs. Hi - just wanted to say that I've written my first book club review. It's in advance, as I likely won't online again until Monday. I'd love to be linked in your post though. I loved going there myself as did your great nephew. He has been sitting next to me as I read the blog to him. He seemed to enjoy it and even called you by name when he saw your pic. He's so smart. Love your ladies in the shark picture, but that fringehead freaks me out quite a bit! As a teacher, I LOVE stuff like this. And aquariums are simply the best! That is a cool place! And I love your commentary on that fish. HA! Just stopped by to say, Happy Friendship Day! This brings back memories of my visit to the Calgary Aquarium. Looking at water creatures is always fun, no matter the age. Great and so manu info!! !